Baisakhi is also known as harvest festival is celebrated with great devotion and fun. 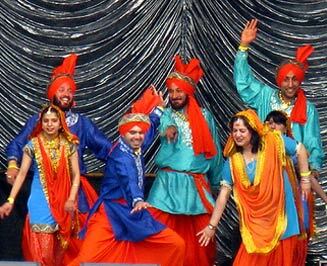 Know more on Baisakhi festival and its celebrations in India. The harvest festival of Baisakhi, celebrated on April 13/14 every year, is a time for renewed faith and energy. People of north India, especially in the villages of Punjab, swing to the beats of drums and celebrate the day with religious fervor. Known as 'Khalsa Sirjana Diwas' (the birth of khalsa), Baisakhi today is celebrated not only by Sikhs and Punjabis, but by all communities with equal enthusiasm. Many Punjabis and Sikhs celebrate Baisakhi in their own way. These are different from the rituals of harvest festival practiced in the villages. Celebrated when the Rabi crop ripens, Baisakhi is not confined too villages and fields only, but now has an urban presence. The real celebrations are in the villages of Punjab when the crop is harvested. In Anandpur Sahib (the birth place of Khalsa) Baisakhi meals are organized in large numbers. In the cities people visit gurudwaras with the family. Not only Sikhs, but people of other communities also visit the gurudwaras with their families and friends to take a holy dip and savour the langar and kadah prashad. On this day the gurudwaras are illuminated and there is a 48-hour akhand path and bhog. The day is usually marked with kirtan, kadah prashad and langar. Womenfolk prefer to dress up in white suit with orange dupatta on this day while going to the gurudwara. For Sikhs it holds special significance, as on this very day their 10th guru, Guru Gobind Singh, organised the order of Khalsa and gave a new impetus to the teachings of the earlier nine gurus. As this is an auspicious day many people go for baptism in gurudwaras all over India. As far as the tradition is concerned it varies from family to family. There is a path and bhog followed by kadah prashad and langar.